Today we look at another narrative in Johnâ€™s story of Jesus’ resurrection and appearances, from John 20:19-29 (ESV). As we said in our last post, this two-part story forms the climax of the Gospel of John, and specifically, of its resurrection narratives. It completes a “development” of sorts in terms of faithâ€”John believed because he saw the empty tomb, Mary believed when she heard the personal word of her Master, now Thomas believes when he sees the empirical evidence of his Lord in the flesh. Today’s passage ends with a reminder from Jesus himself that those who live in post-apostolic days will not be afforded the same evidence, but may still share in the blessing of faith (20:29). So, in essence the journey of believing taken in these resurrection narratives is actually a regression, not a progression! At Jesus’ tomb, John simply believed, the only evidence being the tombâ€”that is the highest form of faith described here. However, by the end of the narratives, Thomas must actually see and touch the flesh of the risen Christ in order to trust him. The “blessing,” which Jesus gives in 20:29, is for those who will believe, not in the way Thomas did, but as John did. That is why, after the account of Thomas, the author immediately gives a closing “invitation” to all his readersâ€”Believe! “Now Jesus did many other signs in the presence of the disciples, which are not written in this book; but these are written so that you may believe that Jesus is the Christ, the Son of God, and that by believing you may have life in his name” (20:30-31). 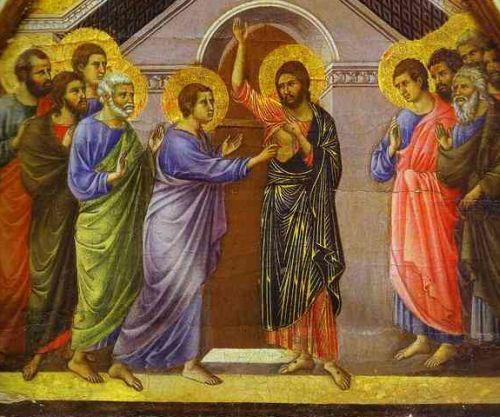 In this Gospel, the resurrection is portrayed as the ultimate “sign” performed by God through Jesus, so that we might believe and have eternal life. The risen Lord bringing peace to those who cower in fear. Jesus’ impartation of the Holy Spirit, as he had promised in the Upper Room (John 14-17). Jesus setting the apostles apart as his representatives and giving them the authority to forgive sins. These are vital components of this text, worthy of attention and contemplation. accepting Jesus’ claim that “I and the Father are one” (10:20) and that “No one comes to the Father except through me. If you had known me, you would have known my Father also. From now on you do know him and have seen him” (14:6-7). Is this where you are, my friend? May you know the blessing of belief. May you come to know that Jesus is the Messiah, the Son of the living God. May you receive and experience fullness of life and life eternal in his name. If we can help you with your faith questions or issues, let us know. You are among friends on the same journey.